Raghav Muralidharan, has been learning Mridangam from Sri. Srinath Bala of Jayamangala music school from the age of 8. He regularly accompanies in the music festivals in the Washington area and won an award in the Junior Mridangam competition at the Cleveland Thyagaraja Aradhana in the year 2009. Raghav has been continuing his advanced training under Sri. Neyveli Narayanan for the past five years. In December 2013, Raghav accompanied for four mini-concerts in the Chennai Music Season with Isai Mazhalai and Cleveland Aradhana Global Heritage festival. 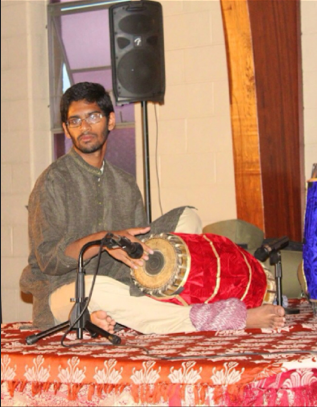 As a freshman in engineering at the University of Michigan Raghav plays mridangam for 'Sahana', a classical music student organization in Ann Arbor.